Among the functions of TG2 we can find the function called “Voronoi”. If you’re well schooled in World Machine, you know that it can sometimes be a helpful one. 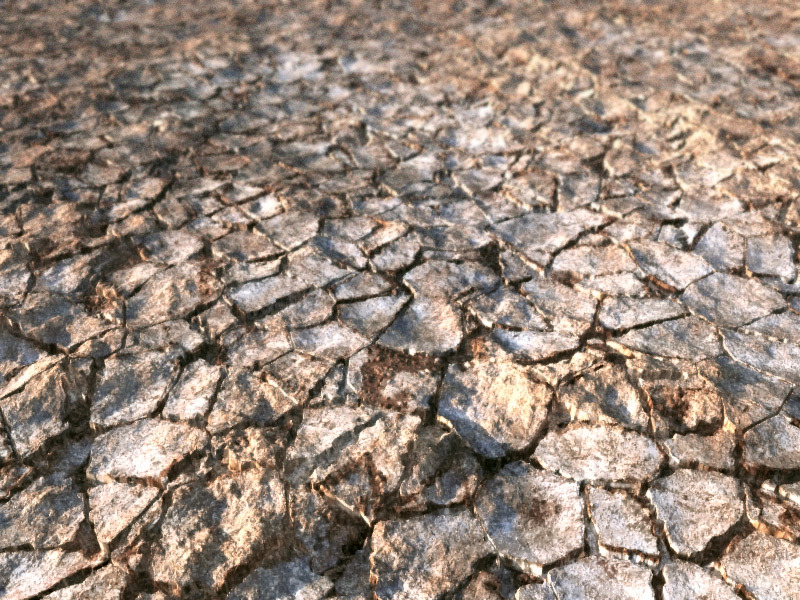 The following is one possibility to use the Voronoi function to create dry, cracked ground. First we add a Voronoi 3D Diff Scalar from the Noise functions. Looking at it, we see three inputs. The one on the right is for the Seed, the one in the middle for the Scale and the one on the left is a simple Input port. So, we need two Scalars, one for Seed, one for Scale. In each case we create one Constant Scalar: The one for Scale gets the value desired for the size, the one for Seed is simply any positive number. In order for the Voronoi shader to work, it needs a Get Position as the primary input. 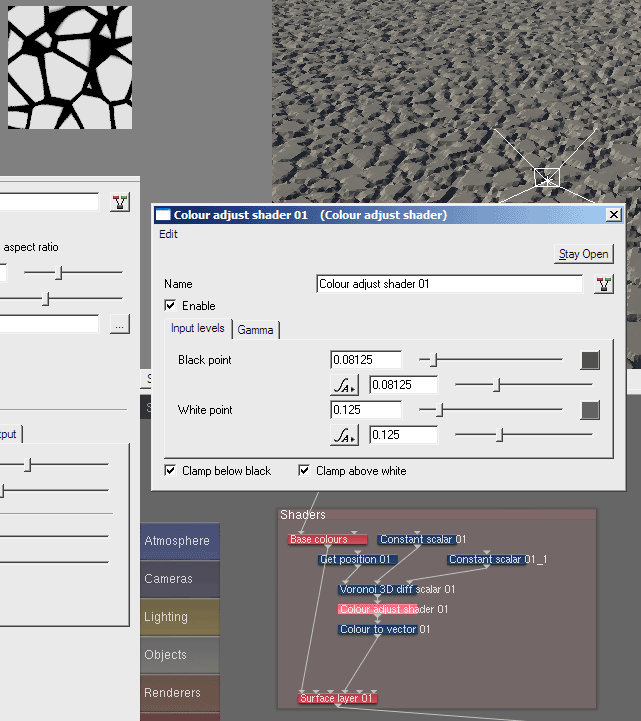 We attach a Color Adjust shader to its output and a Color to Vector node to the former. 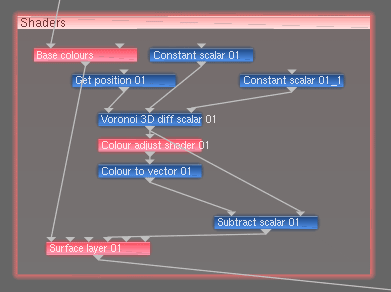 We then connect its output to the displacement input of a surface layer or to a simple Displacement Shader. Why do we convert the output of the Voronoi to a colour (this conversion happens automatically) and back again? 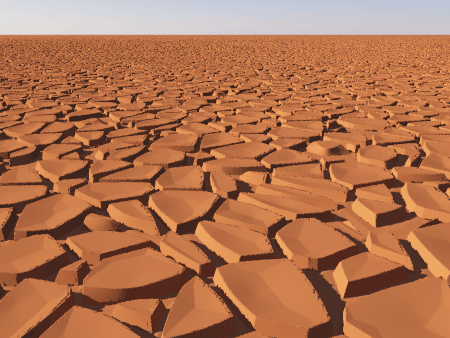 The Color Adjust Shader provides us with the tools to change the values of the Voronoi so that the picture resembles ice floes or cells. By displaying it as a colour we can immediately see the results in the small shader preview in the upper left if we zoom in enough (using the “-” button). Now we add a Subtract Scalar after Color to Vector that subtracts the Voronoi 3D Diff Scalar from the output of color to vector. This lowers the centre of the floes and it looks as if they were bent upwards at the edges. Thanks to Xero who rendered the image based on this tutorial and allowed us to use it! A question: what is the exact entries for the two constant scalars? They are 0.3 for scale and 0.9375 for the seed, but you’ll have to experiment yourself to find a scale value that works for your scene. In some cases you’ll need a scale as high as 20 or more. The exact seed value isn’t important, really. A different seed will only get you a different pattern without changing the overall look of the function. Try and change it and you’ll see what I mean. The simpleness of your setup speaks for your in depth thoughts.